Tropical Storm Kirk just passed through the Leeward Islands and when the GPM satellite passed overhead, it revealed that Kirk continued to bring rain to the chain on Sept. 28. The Global Precipitation Measurement mission or GPM core satellite passed over Tropical Storm Kirk at 8:36 a.m. EDT (1236 UTC) on Friday, Sept. 28, 2018. 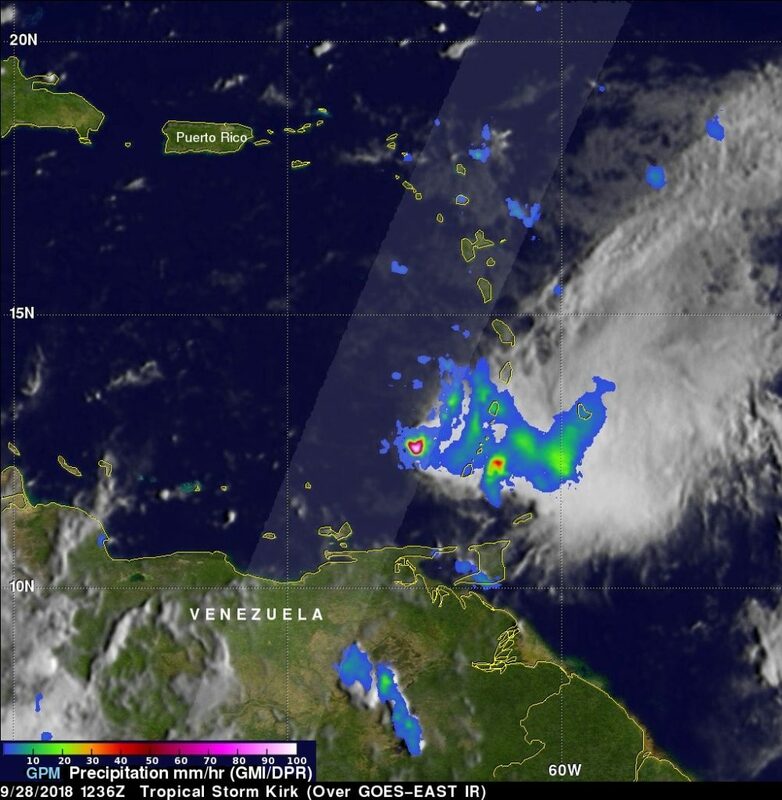 GPM found the heaviest rainfall was around the center of circulation located west of the Leeward Islands. There, rain was falling at a rate of 100 mm (about 4 inches) per hour. Rain extended east of the center over the island chain where rain was falling between 10 and 40 mm (0.4 and 1.5 inches) per hour. GPM is a joint mission between NASA and the Japan Aerospace Exploration Agency, JAXA. 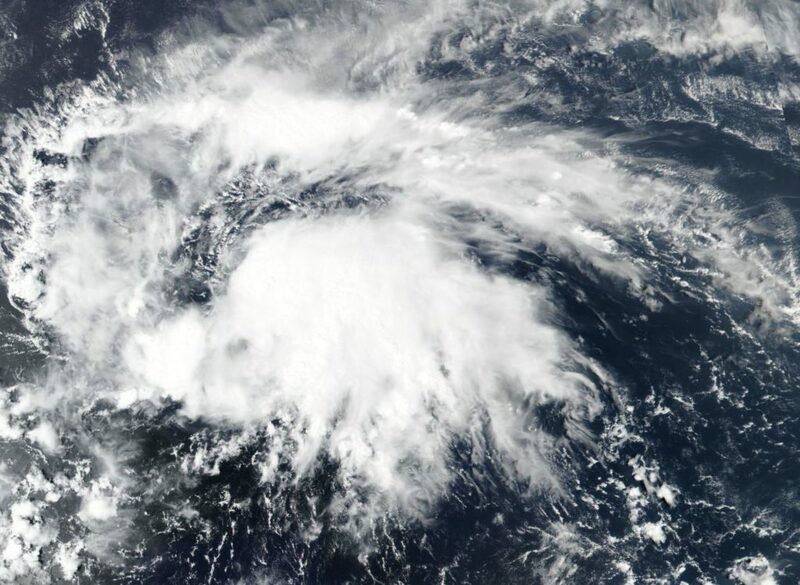 Meanwhile, the Meteorological Service of St. Lucia has discontinued the Tropical Storm Warning for St. Lucia, and the Meteorological Service of Barbados has discontinued the Tropical Storm Watch for St. Vincent and the Grenadines. At 11 a.m. EDT (1500 UTC), the center of Tropical Storm Kirk was located near latitude 13.8 degrees north and longitude 63.6 degrees west. That’s about 185 miles (295 km) west-southwest of Martinique. Kirk is moving toward the west-northwest near 13 mph (20 kph), and this motion is expected to continue through Sunday. On the forecast track, the center of Kirk or its remnants will move across the eastern and central Caribbean Sea over the next day or two. Reports from an Air Force Reserve Hurricane Hunter aircraft indicate that maximum sustained winds have decreased to near 45 mph (75 kph) with higher gusts. Kirk is forecast to weaken to a tropical depression tonight, and then degenerate into a trough of low pressure on Saturday, Sept. 29. For forecast updates on Kirk, visit: www.nhc.noaa.gov. As Tropical Storm Kirk came back to life, the Global Precipitation Measurement mission or GPM core satellite analyzed its rainfall. Kirk is headed toward the Lesser Antilles and Warnings are in effect. On Sept. 27, the National Hurricane Center or NHC posted a Tropical Storm Warning for Barbados, St. Lucia, Dominica, Martinique, and Guadeloupe. A Tropical Storm Watch is in effect for St. Vincent and the Grenadines. On Sept. 25 tropical storm Kirk seemed to be dissipating but on Sept. 26 the tropical storm has sprung back to life. Convective activity near the center of tropical storm Kirk’s remnants increased and became better organized. 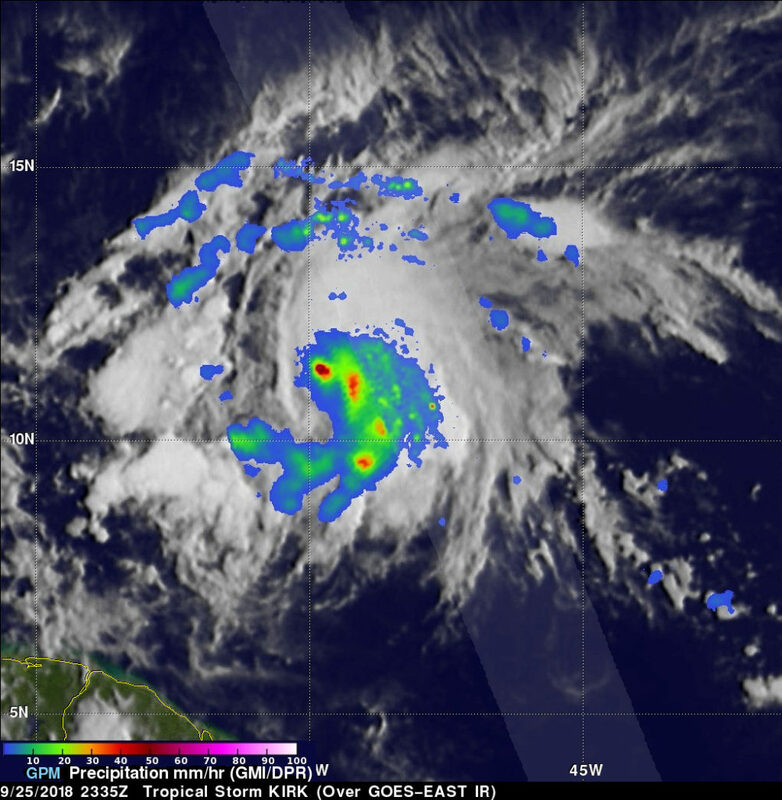 The GPM core observatory satellite scanned reviving tropical storm Kirk on September 25, 2018 at 7:35 p.m. (2335 UTC). 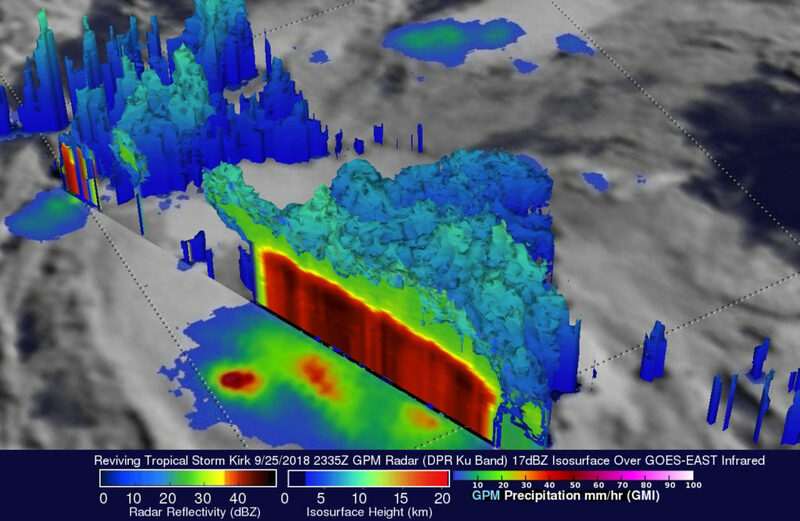 Data collected by the satellite’s Microwave Imager (GMI) instrument showed that intense convective precipitation was taking place near the center of the reviving tropical storm. GMI’s scans indicated that rain was falling at over 71 mm (2.8 inches) in some of these storms. GPM’s Dual-Frequency Precipitation Radar (DPR) probed storms that were located to the east and northeast of the center of the regenerating tropical storm. DPR found rain there falling at a rate of over 69 mm (2.7 inches) per hour. The GPM satellite’s radar data revealed the 3D structure and intensity of precipitation in the eastern side of the reviving tropical storm. The simulated 3D cross-section used GPM’s DPR Ku Band data were created at NASA’s Goddard Space Flight Center in Greenbelt, Maryland showed the heavy precipitation falling east of the tropical storm. The satellite found that this area of precipitation was returning strong radar echoes of almost 60 dBZ to the satellite. The term dBz is basically a measure of the strength of the reflected energy. The higher the dBz value, the stronger the intensity of the precipitation detected by the radar. GPM also found that precipitation was reaching heights above 11.2 km (6.9 miles) in a few powerful storms. GPM is a joint mission between NASA and the Japan Aerospace Exploration Agency, JAXA. 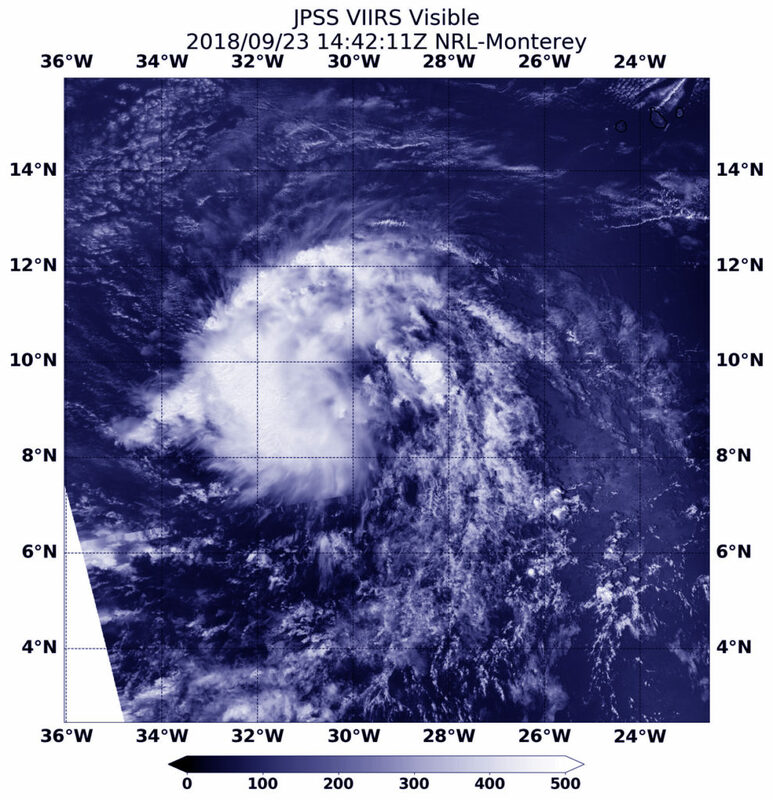 At 11 a.m. EDT (1500 UTC) on Sept. 27 the center of Tropical Storm Kirk was located near latitude 13.8 degrees north and longitude 59.3 degrees west. That’s about 45 miles (70 km) north-northeast of Barbados. Kirk was moving toward the west-northwest near 15 mph (24 kph) and this general motion with a slight decrease in forward speed is expected over the next few days. On the forecast track, the center of Kirk will move across the Lesser Antilles within the Tropical Storm Warning area by this evening. Maximum sustained winds are near 50 mph (85 kph) with higher gusts. Gradual weakening is anticipated during the next couple of days, but Kirk is forecast to move across the Lesser Antilles and into the eastern Caribbean Sea as a tropical storm. Interests elsewhere in the central and northern Lesser Antilles should monitor the progress of Kirk. NASA-NOAA’s Suomi NPP satellite passed over Tropical Storm Kirk as it was regenerating in the Atlantic Ocean. Because Kirk regenerated east of the Caribbean Sea, warnings and watches were posted for the Lesser Antilles. On Sept. 25 at 12:30 p.m. EDT (1630 UTC) the Visible Infrared Imaging Radiometer Suite (VIIRS) instrument aboard NASA-NOAA’s Suomi NPP satellite provided a visible light image of re-forming Tropical Storm Kirk. The VIIRS image showed central convection and forming thunderstorms around the center of circulation. A Tropical Storm Warning is in effect for Barbados, St. Lucia, Dominica, Martinique and Guadeloupe. A Tropical Storm Watch is in effect for St. Vincent and the Grenadines. At 11 a.m. EDT (1500 UTC) on Sept. 26 the center of Tropical Storm Kirk was located near latitude 12.1 degrees north and longitude 54.3 degrees west. That’s about 360 miles (575 km) east-southeast of Barbados and 485 miles (780 km) east-southeast of Martinique. Kirk is moving toward the west near 18 mph (30 kph). A westward to west-northwestward motion is expected over the next few days. On the forecast track, the center will move over the Lesser Antilles within the Tropical Storm Warning area Thursday night. Maximum sustained winds have increased to near 50 mph (85 kph) with higher gusts. Little change in strength is forecast until Kirk crosses the Lesser Antilles, followed by weakening over the eastern Caribbean Sea. Tropical Storm Kirk formed on Saturday, Sept. 22. By Monday, Sept. 24, Kirk lacked the closed circulation that is a prerequisite for tropical cyclone status. The NOAA-20 satellite provided a visible image of the storm at its peak. On Sept. 23, 2018 at 10:42 a.m. EDT (1442) NOAA’s JPSS-1 (NOAA-20) satellite captured this visible image of Kirk at the height of its strength when it was a tropical storm with maximum sustained winds near 40 mph (65 kph). NOAA-20 is the second in a series of five polar-orbiting satellites to monitor the Earth’s atmosphere, land and oceans. NASA builds the JPSS series of satellites and NOAA operates them. At 11 a.m. EDT (1500 UTC) on Sept. 24 the remnants of Kirk were located near latitude 10.0 degrees north and longitude 39.5 degrees west. That’s about 1,070 miles (1,725 km) west-southwest of the southernmost Cabo Verde Islands and about 1,470 miles (2,365 km) east of the Windward Islands. The remnants are moving toward the west near 23 mph (37 kph) and this general motion is expected to continue over the next few days. Maximum sustained winds are near 40 mph (65 kph) with higher gusts. Little change in strength is forecast during the next 48 hours. The remnants of Kirk will be monitored during the next few days in case regeneration into a tropical cyclone should occur.